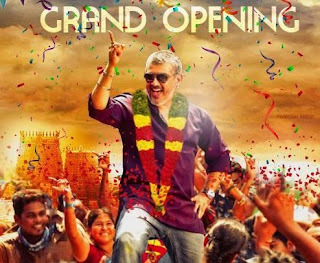 Ajith’s ‘Vedalam’ has emerged a clear winner in the Kollywood box-office this Deepavali, though Kamal Haasan’s ‘Thoongavanam’ too is running packed houses. According to trade sources, the film has collected Rs 15.4 crore on the first day, which is higher than that of Superstar Rajinikanth’s ‘Lingaa’ and Vijay’s last year Deepavali release ‘Kaththi’. The second day has minted more than 9 crores in Tamil Nadu. “Ajith fans are celebrating the movie like anything and tickets are not available in most of the theatres till this weekend. The film is sure going to be a blockbuster and one of the biggest hits of the year,” said a source in the trade. The film also has an ensemble cast list which includes Shruthi Hassan, Lakshmi Menon, Soori, Thambi Ramaiah, Ashwin Kakumanu, Kabir Singh, Rahul Dev, Vidyullekha Raman and many others in the supporting cast. Released in Dolby Atmos Sound System, the film provides an engaging Cinema experience. Directed by Siruthai Siva, the film produced by A M Rathnam has music by Anirudh. The young composer watched the movie at a theatre in Chennai along with fans, who appreciated him for coming out with ‘theri’ music for the ‘thala’ movie.